Dementia researchers at the University of Southampton have received a welcome funding boost for two pioneering studies to shed more light on Alzheimer’s disease. Almost £100k of new funding has been given to scientists in the region from Alzheimer’s Research UK, the largest charity funder of dementia research in the UK. Alzheimer’s disease affects around half a million people in the UK today, causing devastating symptoms of memory loss, confusion, personality change and a gradual decline in the ability of someone to manage daily life. Alzheimer’s is the most common cause of dementia, a condition which affects two in every three care home residents and around a quarter of everyone currently in a hospital bed in the UK. Alzheimer’s is a brain disease caused by an abnormal build-up of proteins in the brain that interfere with the normal functioning of brain cells. Through cutting-edge research, scientists are learning more about the damaging process that happen in the brain in Alzheimer’s, in a bid to develop effective new treatments to help those affected. Dr Mariana Vargas-Caballero, a lecturer at the Institute of Life Sciences, has been awarded £48k for an innovative 18-month project getting underway next month. The study aims to shed more light on two of the hallmark abnormal proteins that build up in the brain in Alzheimer’s, called amyloid and tau. She will use mice bred to develop a build-up of these proteins to study how they affect the health of brain connections. By understanding more about this complex process, Dr Vargas-Caballero aims to gain new insights into how to develop medicines that could maintain the health of nerve cells for longer in diseases like Alzheimer’s. Dr Ruihua Hou, a psychiatrist and clinical researcher at the University Faculty of Medicine, has secured £50k of funding from the charity for a two-year study due to start later in the year. The study will use MRI brain scanning techniques in people with Alzheimer’s disease to study a key area of the brain implicated in the disease. 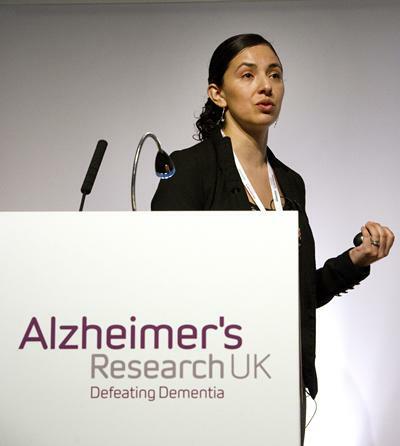 Dr Mariana Vargas-Caballero is a Lecturer in Neuroscience located in Biological Sciences at the University of Southampton.